My most linked-to post ever, yesterday’s denialists missive, has attracted the usual suspects. Not surprisingly, Akismet’s spam filter blocked them and I don’t feel like unblocking them. Typical tactic of the denialists – overwhelmingly loud shoutdowns instead of actual scientific evidence. In lieu of opening up my blog to becoming another nutjob-infested place, I will address the “issues” that denialists like to throw out in defense of the lack of action toward anything like good stewardship of the planet. More ice is forming in the Antarctic than is being lost. This is actually a predictable effect of the current warming cycle. More warmth equals more evaporation equals more precipitation, particularly at the poles (more at the South than North for other reasons). It also equals less precipitation in the tropics. These things are predicted, and they have happened. Antarctica is cooling. No. It had a cooling trend over 60% of its mass, several years ago. It’s a lot more clear now, as the warming trend has become much more widespread. Also, Antarctica is susceptible to warming and cooling based on ocean temperatures, so it would be predicted to warm later than the Arctic region. This is predicted, and it is happening. It’s cold in BC right now, so global warming is a hoax. 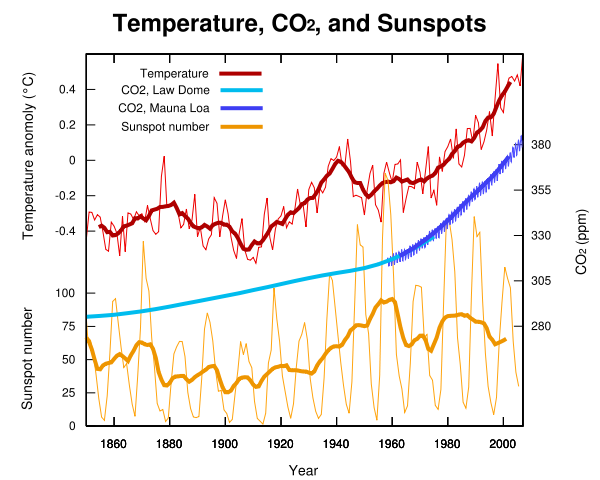 Local temperature variations do not change a global multi-decade trend. See also, “it’s been a cool year all over” for more nonsense. Yes, it has been the coolest winter since 2001. But, it’s still the 16th warmest year on record. So, “cooler” than “really hot” is not much to go by. The warmest years on record are 1998, 2005, 2003, 2002, 2004, 2006, and 2007. The arctic sea ice came back big time this winter. Yes, it did. But, there are two types of ice pack in the arctic – perennial and annual. The annual ice made a nice recovery. The perennial ice, though, is still much decreased. The perennial ice covers about 30% of the arctic, where is had covered 50-60% of that area in the past. Perennial ice (which lasts 6 or more years) covered 20% of the arctic as recently as the 1980s, but now accounts for a mere 6% of the coverage. One year does not make a trend. In the past twenty years, 17 of them are the top 17 hottest in 150 years of records. Sunspots are to blame for the warmer temperatures. Sunspots have not increased in 20 years, so how could they be to blame? NASA says solar increases do not have the ability to cause large global temperature increases.” The Sun is approaching solar minimum, yet global warming continues. Calling people who deny the incredible mass of data about global warming “denialists” rather than “skeptics” is an ad hominem attack and I should be ashamed of myself. I am a member of the Skeptic Society. Skeptics don’t believe things contrary to masses of evidence, willfully denying the vast majority of experts and all the research, cherry-picking bits of contradictory evidence to support a tiny minority opinion. Nope. Doesn’t happen. I’m amazed that people can call themselves “skeptics” and yet retain such unwavering belief in something. What are the denialists afraid of? If the global warming “conspiracy” has its way, we’ll get cleaner air, cleaner water, less dependence on hostile governments, more wildlife returning to their habitats, and a booming economy based on renewable rather than finite resources. Oh, please don’t throw me in the briar patch! This entry was posted in Science, Stupid People and tagged climate change, conspiracy theory, denialists, global warming on 2008.03.26 by Gary.